Thomas Carlyle—the once celebrated but now unread Victorian sage—was gloomy, clumsy, pedantic, and literally (and otherwise) flatulent. His wife, Jane, was bitter, sardonic, brilliant (a guest informed her, “You would be a vast deal more amiable if you were not so damnably clever”), and intellectually frustrated. His marriage proposal to her, not one to set a heart aflutter (“Together we may fail to be happy; separate, we can hardly fail to be miserable”), nicely set the tone for their less than cheerful matrimonial life. Indeed, Samuel Butler famously thanked God for letting the Carlyles marry each other “and so make only two people miserable instead of four.” But this notoriously unhappy union is among the most compelling in literary history, because in their letters and journals these two wrote slyly, caustically, and endlessly about their intellectual and political world and, more important, about themselves and their marriage (subjects they obviously—and charmingly—found ceaselessly absorbing). More than 9,000 of their letters survive, making theirs probably the most minutely and intelligently documented marriage ever. 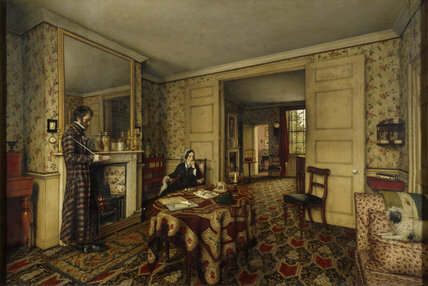 (Letter writing was the ideal vehicle for Jane’s waspish wit; although Thomas is rightly castigated for his narcissistic insensitivity to his wife, one suspects that he provided her with the irritant necessary for her peculiar literary pearls.) A number of writers—most notably Thea Holme, in The Carlyles at Home, and Phyllis Rose, in Parallel Lives—have rendered sensitive, if at times anachronistic, portraits of this marriage. But these have been miniatures; Rosemary Ashton works on a broad canvas. A fluent scholar and a lively writer, she has absorbed everything the Carlyles wrote, and seemingly everything written about them by their contemporaries (they were by far the most famous literary couple of the century). Eschewing flabby generalization and unfounded speculation, she depicts and analyzes their partnership with precision, and also with fairness and detachment (quite an achievement, especially when assessing the sullen, windy, and often simply impossible Thomas). Ashton’s 550-page book is, as its subtitle promises, a portrait of a marriage, but it’s perforce also a portrait of an age, because it puts the couple where they belong if one is to understand them at all: at the very center of the Victorian intellectual and literary elite. There they argue, flirt, and gossip with—and exasperate—the luminaries of their time, including Dickens, John Stuart Mill, George Eliot, Darwin, Thackeray, Ruskin, Emerson, Goethe, and Giuseppe Mazzini. Bedford—that fantastically glamorous, cosmopolitan writer—spent the Second World War penned up in Manhattan; before her return to England she “had a great longing to move, to hear another language, eat new food; to be in a country with a long nasty history in the past and as little present history as possible.” So she traveled through Mexico with a woman friend. She took no notes, but she sent postcards; when she got back to London, she called her correspondents to collect those cards and started writing. The result was this, her first book and—by wide agreement—one of the great works of travel literature. Bedford is a hard, even somewhat cynical writer, but she “wanted to make something light and poetic,” and her sharp eye and precise language allowed her to fashion this enormously sensuous work. (Bruce Chatwin declared, “When the history of modern prose in English comes to be written, Mrs. Bedford will have to appear in any list of its most dazzling practitioners.” Without question.) Sporadically out of print, it has just been reissued. Buy and read this marvel. This book, published in 1973 and out of print for several years, has now been reissued. Although a valuable survey of the literary legacy of the Civil War, a subject of staggering cultural and historical importance, the book will always be overshadowed by one of the very few masterpieces of American literary history and criticism, Edmund Wilson’s Patriotic Gore, written eleven years earlier, which explored the same territory (albeit in a far more idiosyncratic fashion). Aaron, now a professor emeritus at Harvard, explicates the impact of the war on writers from Hawthorne and Melville to Faulkner and the Nashville Agrarians (his assessment of the Agrarians is by far the shallowest and most hostile chapter in the book; generally this liberal Yankee is at a loss when he strays below the Mason-Dixon line). Yet he very oddly neglects the two greatest writers of the war itself—Lincoln and Grant. And although his analyses of individual authors are often keen, he stumbles badly in his overall thesis. In his introduction he states, “One would expect writers … to say something revealing about the meaning, if not the causes, of the War,” and he argues implicitly throughout his book that in fact “writers”—by which he means fiction writers and poets—failed to do so. But why would we look to imaginative writers, as Aaron does, for what he calls “historical insight”? The Iliad, after all, is hardly an exposition of the meaning and causes of the Trojan War. Aaron is clearly disappointed in Ambrose Bierce when he writes that Bierce’s “response to the War had always been intensely personal, never philosophical”; but isn’t a personal response precisely what we want from a writer of essays and short stories? Puzzled that novelists and poets neglected to approach their subject as historical philosophers (and, it would seem, annoyed that they failed to impose on the war the “meaning” he finds in it), Aaron offers a nebulous, and what we would now characterize as a PC, explanation: “Race,” he asserts, “blurr[ed] literary insight.” He uses the fact that African-Americans figured only marginally in the literature of the war as evidence that writers were psychologically resistant to confronting the racial aspect of the conflict (which to him is its central aspect). The “literary dearth,” Aaron avers, “is to be accounted for by the blocking out of race.” Well, maybe. But Aaron himself seems to be lacking in historical insight: the preoccupations of the present, he ought to know, should not be exported to the past. Hobsbawm is one of the ten or twelve greatest historians since the Second World War. But as these memoirs show, he is also self-regarding and obscenely wrongheaded. His reputation as a scholar and a writer rests largely on three books—The Age of Revolution, The Age of Capital, and The Age of Empire—that together form a magisterial history of what he calls “the long nineteenth century” (1789-1914). That history, described by The Observer as “part of the mental furniture of educated Englishmen,” is concerned with long-term economic trends and broad secular patterns, not with great men and dramatic events. (His more recent Age of Extremes, his biggest seller and an intelligent history of the global economy in “the short twentieth century,” 1914-1991, lacks the depth and verve of his nineteenth-century history.) But Hobsbawm’s standing has always been based as much on his political affiliation as on his literary accomplishments. A communist from 1932 until 1991, he remained loyal to Moscow through the Terror Famine, the Great Terror, and the show trials; through the Hitler-Stalin Pact; through Khrushchev’s exposure of Stalin’s crimes; through the Soviets’ suppression of Czechoslovakia in 1949, of Hungary in 1956, and of Czechoslovakia again in 1968. He devotes a large part of his autobiography—certainly the most engaging sections, and certainly those that got the most attention from reviewers and commentators in Britain, where the book was first published last year—to explaining this long-standing allegiance. That explanation amounts in large part to conflating anti-fascism and the struggle for social justice, on the one hand, and the communist movement, on the other. (In his highly selective and romantic defense of communism he even suggests that East German apparatchiks “devote[d] their lives” to “the ideals of freedom and justice.”) This apologia, of course, dishonors the past century’s intellectually honest men and women of the left who recognized that the October Revolution was rotten and murderous from its inception and who fought for freedom and justice and against both fascist and Soviet tyranny. Add to this affront Hobsbawm’s arrogant ignorance of the United States (he applies David Rousset’s term for the Nazi death camps—“univers concentrationnaire”—to the U.S. prison system) and self-important passages like the one in which he implies that his own writings contributed to the Third World’s wave of democratization in the 1980s, and you may find yourself—as I did more than once—hurling this book across the room. George Curzon (1859-1925) was seemingly marked for greatness. Dubbed, with envy and irritation, “a most superior person” by his contemporaries at Balliol, the aristocratic striver won a fellowship to All Souls, traveled widely, wrote scholarly tomes on the Near East, and was the most glittering figure in England’s most glittering social set (where he conducted a series of affairs with some of the most prominent married women in the kingdom). All this before he was twenty-seven, when he was elected to Parliament. Five years later he became undersecretary for India. At thirty-nine he secured what was probably the most powerful appointed position in the world: he became Viceroy of India, the ruler of almost 300 million people. The youngest man ever to hold that title, Curzon was, for better and worse, perfect for the job. Since his days at Eton this prodigious worker had essentially spent his intellectual life preparing for it; no politician knew more about India and its neighbors. He and Cromer of Egypt were the most capable, briskly efficient, and high-minded imperial administrators at the apogee of the British empire. As for the worse, no one could possibly have been temperamentally better suited to pseudo-sovereignty. Pompous, supercilious, self-pitying, pedantic, and meddlesome, Curzon possessed outstanding abilities, but they were all but eclipsed by his pestiferousness. His unusual capacity for treading on important toes and creating enemies destroyed his brilliant viceroyalty. Although an effective Cabinet minister during the First World War and Foreign Secretary in the early 1920s, he had alienated too many in his party to achieve his ultimate goal, the prime ministership, and he died a disappointed man. This distinguished and immensely accomplished failure has been enormously fortunate in his biographers. Harold Nicolson, who worked for Curzon at the Foreign Office, wrote a characteristically astute and elegant account of him as Foreign Secretary (Curzon: The Last Phase); Kenneth Rose, in Superior Person, gave a sparkling portrait of Curzon’s early years and of the interlocking social, intellectual, and political elite that formed his circle; David Dilks, in his two-volume Curzon in India, offered a rich study of nearly every aspect of his viceroyalty. But until now no single work adequately chronicled Curzon’s entire life. Gilmour’s absorbing, intelligent, quizzical, and stylish biography covers with equal authority and panache late-Victorian country-house weekends, maneuverings within the War Cabinet, and the background of the Treaty of Lausanne. (A typical aside: “The best years of the Curzons’ marriage were spent in India. They were often apart and, when together, were seldom alone.”) But the focal point of this 684-page book is, as it must be, Curzon’s years as Viceroy. No clearer and more vivid account has been written of the high point of the Raj—its workaday management as well as its pomp. Scholarship on the Holocaust continues to swell. And, inevitably, so do the scholarly debates and controversies—some silly, some complicated, a few actually important. Despite its annoyingly clumsy prose, Bartov’s collection of previously published but extensively revised articles is among the most accessible books for the layman hoping to understand the contours of the current historiography. Bartov established his reputation in 1985 with a truly pathbreaking study, The Eastern Front, 1941-45: German Troops and the Barbarisation of Warfare, which demonstrated conclusively that, contrary to the self-serving reminiscences of German veterans, the German army—not just the SS and other Nazi ideologues—had willingly, even enthusiastically, participated in the slaughter of Soviet civilians and in the attempted extermination of the Jews. (He extended and deepened his conclusions in Hitler’s Army: Soldiers, Nazis, and War in the Third Reich.) Not surprisingly, some of the most astute essays here examine various aspects of the Wehrmacht’s complicity in the Holocaust. While avoiding an easy judgmental stance, Bartov draws nuanced but crucial distinctions between wartime atrocities generally (including those of the other combatant states of the Second World War) and those that Germany committed, especially on the Eastern Front, which were, as he shows with precision, uniquely terrible. (This is an especially significant discussion given the proclivity of some German revisionist historians for drawing facile parallels between the crimes of Nazi Germany and those of Stalin’s Soviet Union.) Although Bartov is an innovative military historian, in his essay on the diaries of the great German conservative, patriot, and Jew Victor Klemperer he also displays a subtle grasp of social and cultural developments, especially the growing, and in the end nearly total, Nazification of German society under the Third Reich. In 1972 the first edition of this book was broadly hailed as the finest jazz biography ever written, but it was flawed. The writing in this revised edition, which includes new interview material, remains ham-fisted, and Albertson still offers no sophisticated explanation for the source and development of Smith’s stupendous musical gift (the influence—or lack thereof—of Ma Rainey, the “Mother of the Blues,” on Smith’s style and phrasing goes essentially unexplored). Albertson nevertheless gives us a remarkably clear-eyed examination of Smith’s personality (and sexuality) and, more important, of the gritty and greedy music business. The milieu in which Smith worked was devoid of saints, but the least appealing characters in the book turn out to be the New York white liberals who applauded and exploited her. Carl Van Vechten, a forerunner of radical chic, emerges as superficial and lecherous. Even worse is the widely but not astutely admired producer John Hammond, who, if not knowingly then certainly irresponsibly, originated and disseminated the (as Albertson meticulously shows) apocryphal story that Smith’s death was the result of a Mississippi hospital’s racist policy. Although Albertson disproved that legend more than thirty years ago, it refuses to die; today Smith is perhaps better remembered for the misrepresented circumstances of her death than for her hard and heartrending music. Ayers scrutinizes the effect of the Civil War and of the debates that preceded it on two communities—Augusta County, Virginia, in the Shenandoah Valley, and Franklin County, Pennsylvania, 200 miles away. In so doing he illuminates both the similarities that existed and the striking differences that developed between the North and the South before and during the conflict. His approach—exploring the impact of public events on daily life, and juxtaposing battlefield and home front—gives readers a fuller picture than they’d obtain from a more conventional micro-history. But Ayers—who has written two superb scholarly studies of the post-Civil War South—falters with his pseudo-literary devices and diction. Throughout, his narrative ambitions exceed his writerly abilities, and the means he uses to unite close-ups and wide perspective (he explicitly embraces a cinematic vocabulary) make for a flabby book. To combine the local and the national, for instance, he’ll often supply lengthy summaries of local newspapers’ reports of faraway events. Add to these defects Ayers’s surprisingly jejune conclusions and this work, although sometimes engrossing, becomes disappointing and a bit pretentious.